Welcome to Allied Technologies. We are your experienced computer repair & IT service provider in Port Charlotte, FL & surrounding areas. 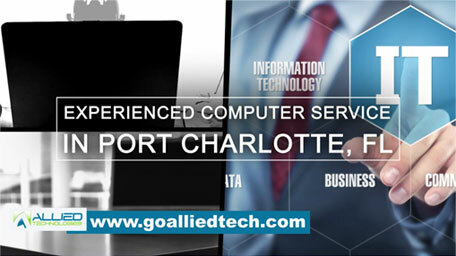 Allied Technologies is a trusted name in IT solutions in Port Charlotte, FL & surrounding areas . In a world where we use computers for everything, having your business’ computer function properly is key to helping your business operate and run smoothly. Call the expert team at Allied Technologies to handle all of your IT and computer support needs. From slow running computers to setting up networks for your business and everything in between, Allied Technologies is the company that can handle it all. With over 25 years of experience in the computer and IT industry, you can be certain your IT issues will be handled in a timely manner. We offer first-rate IT services for home and business clients in Port Charlotte, FL & surrounding areas. "Fill out this form and receive $20 OFF on your first visit!" * We'll take $20 off any repair service over $99 on ANY onsite repair service for first time customers. I am a Broker and when I have a problem having it solved days later does not work for my business. When I called Mike he came several hours later and spent several hours and solved my problem! I was back in business the same day. I will for sure use Allied Technologies again and I will for sure give their contact information. Great response time, put in a new computer while getting everything off my old one in a record two hour time! Even after mike left he called back & gave me tips to figure out my new windows program. EXCELLENT SERVICE & DEPENDABLE. WORRY FREE!! THIS IS A GREAT COMPUTER SERVICE COMPANY & WILL RECOMMEND THEM TO ANYONE, ESPECIALLY SENIORS. I was having problems with 2 very slow 8610 HP printers and it was very frustrating. Mike Burgess, came to 2 different resident locations in North Port & Venice to analyze the situation. He was able to diagnose the problem, tweak the settings on the printer and the network to increase the printer performance. He worked diligently until the problem was solved. I am extremely happy with the level of professionalism and the amount I paid for services rendered. Mike came by quickly and fixed our issue quickly as well. He is pleasant and knows what he’s doing. I like the policy he has of: “if we can’t fix your problem, we don’t get paid.” Based on our experience with Allied, I’d highly recommend them.